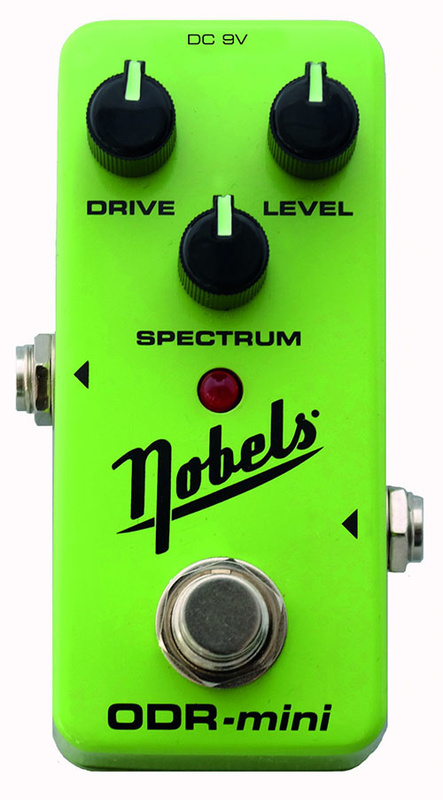 ﻿Nobels may not be the first name that springs to mind when you think of effects pedals, but their ODR‑1 overdrive is by all accounts extremely popular with Nashville's musicians. Though it's designed in Germany, the pedal is built in China — and while it isn't expensive, it delivers a distinctly boutique-like tonality. The ODR‑Mini is essentially a slightly tweaked version of that pedal, with true bypass and a tightened low end, but squeezed into a mini‑format case. This means there's no battery-power option, of course, bit it is fitted with a standard centre-negative barrel connector at the top end of the case, and can be run at any DC voltage between 9‑18 Volts (the higher the voltage, the greater the headroom). At first glance, the control layout looks pretty standard, with Volume, Drive and Spectrum (Tone), but the way Spectrum affects the tone is a little different from the norm. Rather than act as a simple top-cut filter, this adds a low/low-mid boost when positioned clockwise of centre, and what sounds like high- and low-cut filters when left of centre, giving more exposure to the mids. Its detented centre position is about as close as the pedal comes to a transparent sound (with the drive set low), though there's always a little added warmth in the low mids, combined with some dialling-back of the extreme highs. Personally I'd probably have preferred to get some of those highs back at lower drive levels, but that's a personal-taste thing, and wouldn't be a deal breaker for me even then. 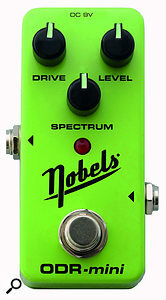 The drive range of this pedal is impressively wide, going from virtually clean to a classic rock‑style overdrive. Using the Spectrum control in the second half of its clockwise travel delivers the most overdrive, as the EQ boost comes pre the drive circuit. However, it doesn't strip away all your dynamics, as some super-saturated pedals do, and even at higher gain settings both chords and single‑note lines retain definition. The circuit responds extremely well to picking dynamics, and if you apply some mid boost by turning the Spectrum control below its half‑way position, the effect is not unlike a smooth version of a Tube Screamer — but without the loss of low end. Set the Spectrum control clockwise of centre to add weight to the low mids and restore more of the upper mids, and that can be really useful for fattening single-coil pickups. While I have to say that this isn't one of those pedals that wows you when you first plug-in, after using it for a while its versatility really does start to shine through. Furthermore, as the drive can be dialled back to almost clean, the ODR‑Mini works well in conjunction with other drive pedals, or amplifiers that are set in that responsive region between clean and dirty. I like the way it retains note definition across the drive range and I can see how the Spectrum control could be particularly handy in a studio session, when you need to switch between guitars with different styles of pickup. Because the pedal smooths out the highs, it may be best suited to single-coil pickup instruments rather than already fat-sounding guitars with humbuckers, but if you like your drive on the more subtle side, this is definitely one to check out.